To live a long and healthy life, achieving a healthy and active lifestyle should be among your top priorities in life. Keeping a healthy lifestyle isn’t a luxury, but a necessity. It is important to prioritize a healthy living above any other thing because you won’t get far without good health. While it is paramount to pay attention to your health, it might be increasingly difficult as work increases and our careers progress. Struggling to keep up with work and life challenges as well as remaining healthy against all odds is almost becoming a paradox. But the good thing is it can be done. 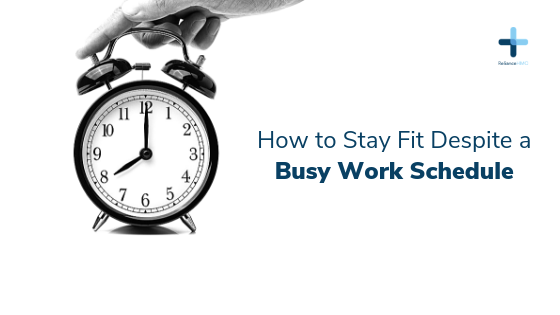 How does one stay fit despite a highly demanding job? Staying fit despite having a busy office schedule can be as easy as a,b,c, if you follow these simple steps highlighted below. Because of the intensity of your job, one of the major factors contributing to you unhealthy living is that you can’t make your own food. The best way to get around this is to prep your meal beforehand. Meal prepping is a great skill to adopt because it allows you to plan your meals for two or three days ahead and it saves you money. While this implies some form of exercise but not necessarily the type you do in the gym. If you have a hard time to make yourself even step foot into the gym, find options that will make physical activities appealing to you. Swimming, football basketball, table tennis and walking are some physical activities you can incorporate into your schedule. Making a schedule is perhaps the most important skill to learn. It helps keeps us grounded and makes us plan out our time better. The first thing to put into consideration when planning your schedule are your priorities. As we’ve earlier established, keeping fit and maintaining a healthy lifestyle should be top priority for anyone alive. The importance of having a good health insurance plan cannot be overstated. Having health insurance reduces the risk of health challenges and surprises as you would have access to routine checkups by your assigned medical practitioner. This also helps in reducing the anxiety that might arise should the need for professional medical help arise. These are just a few tips that can help you fit physical activities into your very busy schedule. Remember that committing to a healthy lifestyle is an important factor in achieving success in all the aspects of your life, including your career..